We’d love your help. Let us know what’s wrong with this preview of Jimi Hendrix by Jimi Hendrix. To ask other readers questions about Jimi Hendrix, please sign up. People tend to forget that Jimi Hendrix was a great lyricist, a poet in his own right besides being the greatest guitar player to walk the face of the earth. His sister Janie L. Hendrix, president and CEO of Experience Hendrix LLC, compiled Jimi Hendrix: The Ultimate Lyric Book, a lavishly illustrated coffee table book the size of a vinyl box set. It contains the words (in alphabetical order) to all the songs of his studio albums and the best known posthumous ones, including unpublished ones 27 People tend to forget that Jimi Hendrix was a great lyricist, a poet in his own right besides being the greatest guitar player to walk the face of the earth. His sister Janie L. Hendrix, president and CEO of Experience Hendrix LLC, compiled Jimi Hendrix: The Ultimate Lyric Book, a lavishly illustrated coffee table book the size of a vinyl box set. It contains the words (in alphabetical order) to all the songs of his studio albums and the best known posthumous ones, including unpublished ones 27 rough sketches for songs that would never saw the light of day. Most of the songs are illustrated by reproductions of the original handwritten lyrics. Jimi did most of his writing on hotel stationary as he traversed the globe to perform his songs before audiences who never experienced something like his sonic explorations and poetic imagery. With this book his words come alive: the tender love songs, the macho bravado, the war in Vietnam, and the prospects of space travel that were so dear to him. 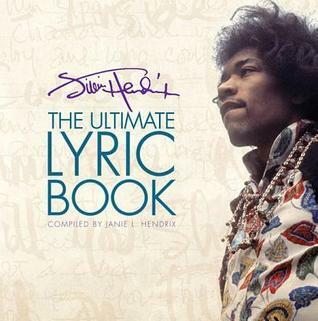 Jimi Hendrix: The Ultimate Lyric Book is a work of love that is a must for all serious fans of the legendary guitarist, a meticulously assembled collection of his songs and more. This is a close as you're gonna get in appreciating the words of an artist whose legacy and influence continues to inspire legions of fans and fellow musicians. continue to rain and cause screamin' pain. Jimi Hendrix was an American guitarist, singer and songwriter. Hendrix is considered one of the greatest and most influential guitarists in rock music history. After initial success in Europe, he achieved fame in the USA following his 1967 performance at the Monterey Pop Festival. Later, Hendrix headlined the iconic 1969 Woodstock Festival. Hendrix helped develop the technique of guitar feedback wi Jimi Hendrix was an American guitarist, singer and songwriter. Hendrix is considered one of the greatest and most influential guitarists in rock music history. After initial success in Europe, he achieved fame in the USA following his 1967 performance at the Monterey Pop Festival. Later, Hendrix headlined the iconic 1969 Woodstock Festival. Hendrix won many of the most prestigious rock music awards in his lifetime and has been posthumously awarded many more, including being inducted into the USA's Rock and Roll Hall of Fame in 1992 and the UK Music Hall of Fame in 2005. An English Heritage "Blue plaque" was erected in his name on his former residence at Brook Street, London in September 1997 and his star on the Hollywood Walk of Fame (at 6627 Hollywood Blvd.) was dedicated in 1994. In 2006, his debut USA album, Are You Experienced, was inducted into the United States National Recording Registry and Rolling Stone named Hendrix number 1 on their list of the 100 Greatest Guitarists of All Time in 2003.